Coming up on Oct 29th @ the American Legion on West 12th St. We are having a Live Auction and asking the Community to support us so we can continue to serve our Veterans who have given so much so we can do what we do. We need about 250 items ( more would be nice ) such as gas cards, gift cards to your favorite one restaurant's or not. Fine art, front end alignment's from car dealer's. I think you get the picture. We understand that some businesses do not have goods or services that can be donated. Many of these types of businesses donate gift cards from other local businesses, which are always of great interest to those attending auctions like this. To show our appreciation, all donors will be recognized many ways: 1) we will produce a list of items to be auctioned that identifies each donor; 2) we will place a description card with donor information on each item; 3) we will have the auctioneer identify the donor when describing each item; and 4) we will provide media announcements when possible (i.e. radio and newspaper). 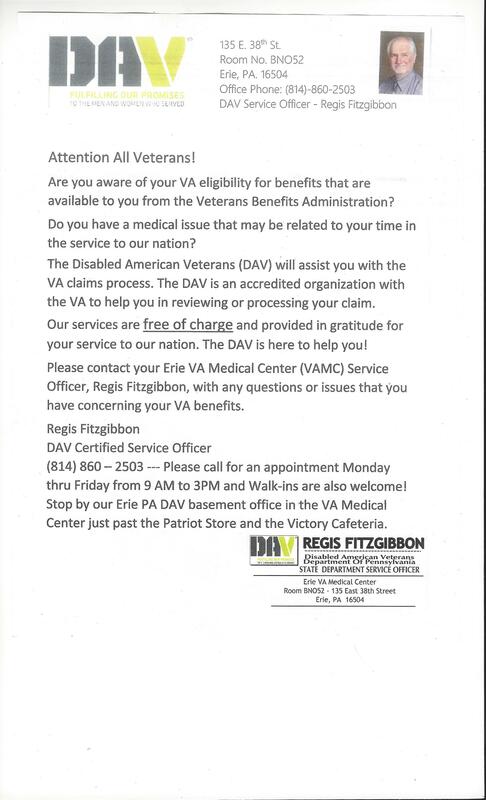 Should you have any questions, we can be contacted by phone at (814) 796-4200, or via email at contact@vmcerie.org. Thank you.